As much as we treasure the true meaning of Christmas, it is also the season of giving! So who’s on your list – friends, neighbors, teachers, coaches . . . sometimes the list gets long, but letting others know you care about them doesn’t have to be complicated or expensive. A simple gift from the kitchen can express your love and best wishes. Nothing beats a warm cup of cocoa on a cold winter night! Hazelnut is one of my favorites. This mix is fun and easy to make. 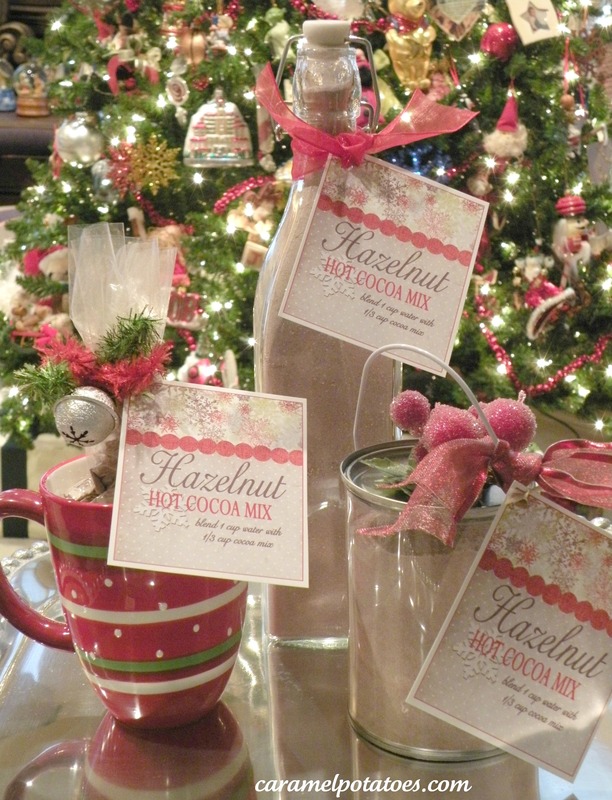 Just wrap it up in a fun container and you have a gift that will warm anyone on your list. We’ve included a gift tag to make it even easier! Mix and sift to remove any lumps. Store in an airtight container. To make cocoa, mix 1/3 cup mix with 1 cup hot water. Note: Change up the creamers for more fun cocoa flavors! 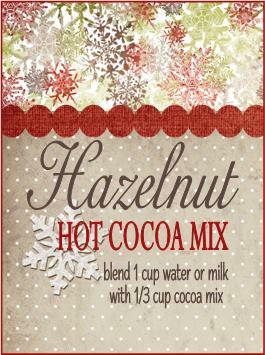 Graphics for tags and cocoa recipe from Summertime Designs. Check out her new kits here! 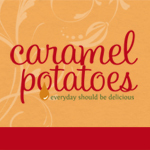 You didn’t mention that your blog was loaded with The Best Recipes!!! My daughter and I just read through the front page and want them all!!! Thanks for sharing, I’m your newest follower. is hazelnut flavored non dairy creamer that international coffee stuff? i don’t drink coffee so i don’t know but would love to make your mix. love your blog, thanks for sharing. You can buy Hazelnut and other flavored non-dairy creamers in the coffee section of your local grocery store – yes, it’s a powder. Hope you love it!